Today marks the 85th birthday of a truly historic recording session in my eyes. 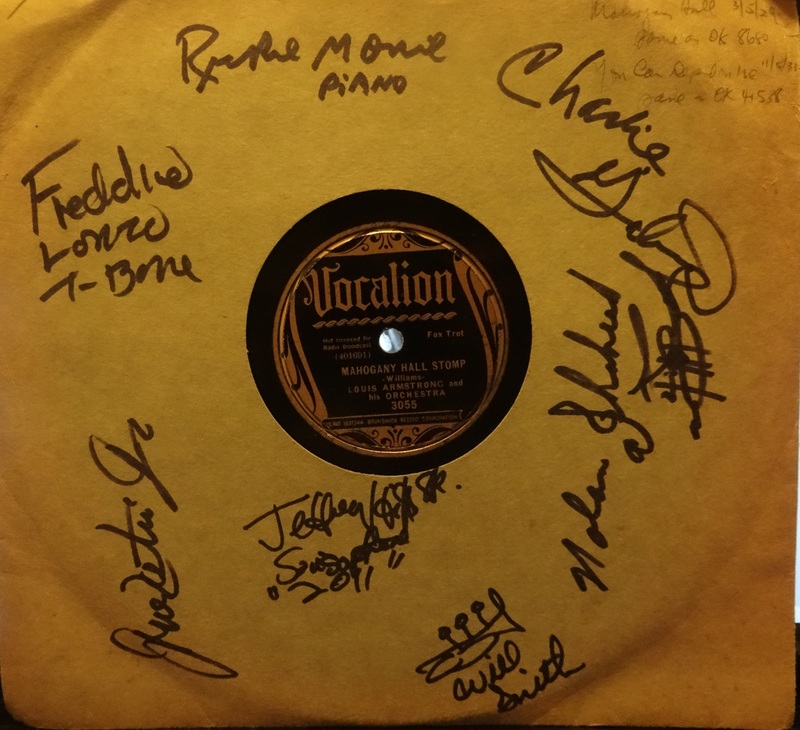 On March 5, 1929, Louis Armstrong stepped into the recording studios at Okeh in New York City with Luis Russell and several members of Russell’s band and recorded three numbers, one of which has been a consistent hit for me during the time I’ve been DJing for Swing dancers. Mahogany Hall Stomp, specifically the version recorded on this date, timelessly retains many of the characteristics I seek out to touch every experience level at a Swing dance. I first unleashed it at the PPAA dance run by the Portland Lindy Society on May 15, 2008. I gave it no higher responsibility than to place it as the centrepiece of my set at my first ever out of town DJ job down in San Diego that December. That set also happened to be the opener for the entire 4-day New Year Swing event. I chose it from all options to represent the year 1929 when I did a one-off ‘History Of Swing’ DJ set in the summer of 2009, covering the years 1925-1949. It was the closer on my 4+ hour radio show for the online Lindy Hop radio show ‘Yehoodi’ in May 2011. When WWOZ were gracious enough to invite me to guest on George Ingmire’s Wednesday morning radio show in New Orleans, I was asked to pick just one tune from my entire collection, to talk about it, and then play it. I’m not sure if George was taken aback by how long I went on about it’s significance in the timeline of Louis Armstrong’s band-leading career, but he seemed to enjoy it. And it was during Summer Satchmofest after all! When I played it during a band break in Arizona, 2010, the next band started coming out to set up on the stage. One player says to the other: ‘THIS is how this tune is MEANT to be played. People play it too fast nowadays.’ The pianist turned to me and said, shrugging: ‘This really is it, isn’t it? It’s simple. It’s simple. Why do we always having to be making things so hard for ourselves? Why is everyone in a rush? This is all you need’. Then, the cherry on the cake, another bandleader who wasn’t scheduled to be anywhere near this particular stage came from nowhere to compliment my selection. I thought: ‘Thanks, but Louis did all the work for me!’. It’s latest outing came just a few days ago in the open air of downtown Portland for all the public to bathe in its magnificence, when I was DJing a band break as part of the Portland Lindy Exchange. Wooden floors indoors, concrete outdoors, radio stations, DJd dances, Oregon, California, Pennsylvania, Washington, Arizona, Las Vegas, New Orleans, and even restaurants in Detroit – I’ve tried it and tested it for six years and it’s still a gem. As a dancer, for a dancer, this version keeps us moving with authority yet retains a relaxed air simultaneously. A dancer can choose to dance to any of its threads, and that’s thanks to the blessing of it having multiple threads. The soloists make it musically interesting from start to finish, notably JC Higginbotham on trombone, Lonnie Johnson with the guitar, and Louis. For the dancer not ready to make use of that device, the rhythm can be danced to in either 2-beat or 4-beat fashion, thanks in no small part to the brilliant bass playing of George ‘Pops’ Foster. I’ve heard many versions of the tune, and one of the keys of this version is the stop-time introduction by Louis. In almost all other versions, I hear a more biting, truncated note played during this part, but on this version, each note of the intro comes out relaxed. Who wants to dance and not feel relaxed? It’s the recording where I first heard Lonnie Johnson. The recording from which I learned what a countermelody is. And there’s something else. Another quality, one that you might argue most of this kind of music has. But here, it really bursts from its heart. It’s full of joy. Of course, I play a far cleaner version of the tune than the one you just heard when I DJ! Now finally, to round off the tale of my lengthy relationship with this recording, I relate how I discovered the background to it when I first heard it. Naturally, I came online and googled ‘the story of mahogany hall stomp’. One of the first few results took me to a blog where the detail and enthusiasm behind the story leapt off the pages. I felt like I was in that recording studio as I read more and more of this blog’s post about this date in that Okeh session. It’s for this reason that I’ll never even attempt to write any music-based posting on any Louis Armstrong recording, because this incredible document to His work does it all, and by someone FAR more qualified. I was later delighted to meet the author for the first time in New Orleans and think I can now proudly call him a friend.